Steel Cargo Container Connecting Units for Global Portable Buildings, Inc.
AC electrical system, which includes breaker panel, fluorescent light fixtures, wall receptacles, wiring, etc. 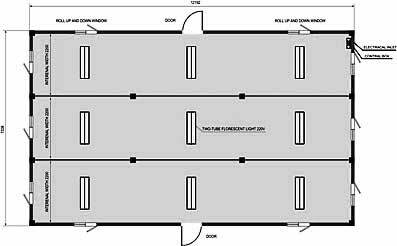 Additional 8' x 40' units can be added to the center of the building. Each unit adds 8' to the building's width, two (2) windows, three (3) fluorescent light fixtures and four (4) removable posts. Ideal for those with large internal space needs. Connect as many units as you want! This building is modular, made of three or more 8' x 40' units connected, and is ideal for requiring alarger internal space. You may connect as many 8' x 40' units as you want, adjusting the building size accordingly. Standard features include AC electrical system, removable internal posts, windows, entrance doors, 2" rigid foam insulation and finished linoleum/vinyl floor. This unit is manufactured from new, ISO standard steel containers and can be quickly transported via standard cargo container ships, cargo planes, trucks or rail; it is shipped as 8' x 40' separated units (in order to maintain transportability on standard cargo infrastructure), that can be connected together on site. Rugged and durable, this building is ideal for classrooms, dining halls, medical clinics, shelters, etc. - adapt your interior usage as needed (see list of common uses). This building requires no foundation and carries a 10 year structural warranty. To achieve proper alignment, this building must be placed on a level surface. Assembly is quick and easy with a watertight reusable rubber seal. This unit also offers great resistance to natural disasters, including resistance to winds up to 100 mph. Delivery of this model is available to all destinations in the USA and worldwide. Additional 8' x 40' Units can easily be connected.